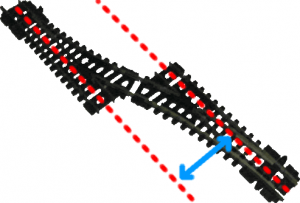 When peco set track points are placed together to make a crossover between two parallel tracks it becomes apparent that the tracks are ‘too far apart’. Set track is made for simplicity not accuracy, I would have use medium points on my layout for more realism but the size of my layout wouldn’t really alow it and also set track is cheaper. 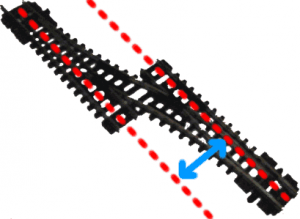 I managed to make the parallel tracks closer together by doing a little ‘track’ engineering. Above is a picture of the tracks before I modified them, it is obvious to the eye they they are incoorectly space apart to scale. 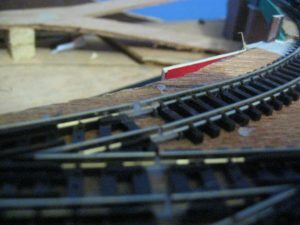 This picture above shows the tracks after I have modified them, the look alot closer together and alot better to scale. The picture above shows flexi track meeting a point with insulated rail joiners, as the railjoiners are made of plastic they can be bendy and not align the track very well, I have solved this on part of my layout using hot glue and a craft knife. Above shows the track with the back rails from the previous picture, except this time you can see that the rails are joinned up with a translucent plastic rail which imitates the profile of the rail.